The Ford Focus car is displayed during a media preview at the Beijing auto show in April. 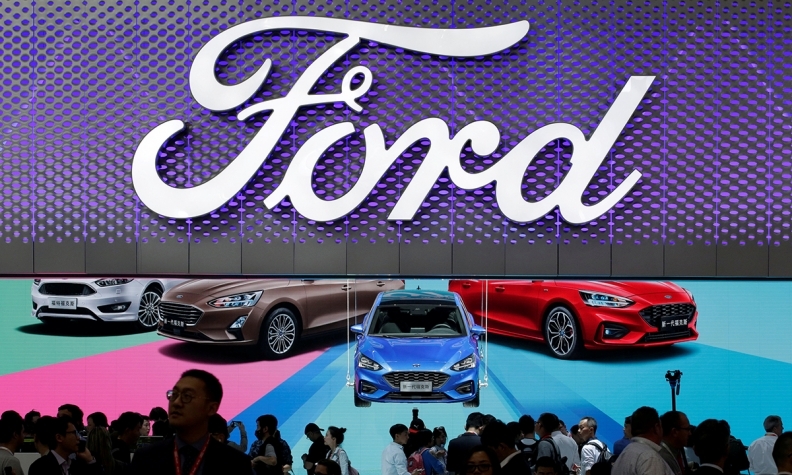 BEIJING -- Ford Motor's imported vehicles are being held up at Chinese ports, three people with knowledge of the matter told Reuters, underscoring how U.S. goods are facing increased customs scrutiny in China amid a tense trade stand-off. The three people said Ford cars and those of its premium Lincoln brand were facing unusual delays at customs, with officials asking for extra technical checks. Two of the people said U.S.-made models of some German carmakers being brought into China, were also affected. China's customs agency did not immediately respond to requests for comment. The hold-ups add to a growing list of American products facing issues at China's borders, as officials try to avert a full-blown trade war. Some trade experts said they believe Beijing is sending a defiant warning to Washington in response to sweeping U.S. trade demands made on China last week. Reuters reported Tuesday that China had ramped up inspections of pork shipped from the United States, after the country's customs agency said it would step up quarantine checks on American apples and logs. The second person, a China-based industry official with knowledge of the matter, said the delays for Ford -- as well as some U.S.-made vehicles from BMW and Daimler AG's Mercedes-Benz -- had been going on for the last two weeks. "Customs pretends there are technical non-conformities of some nature that won't allow them to clear these U.S.-made cars through customs, but the U.S.-China trade frictions must be the background to this," he said. "Although no one will officially admit it." Responding to a request for comment from Reuters, a BMW spokesman said that "U.S.-made BMW cars have not been delayed at the ports as of last week and before." A Daimler spokeswoman said it was "monitoring the situation closely" regarding ongoing trade talks between China and the United States, but that she could not speculate further on other matters. A Ford spokeswoman in Shanghai when asked about the matter said: "We are closely monitoring our situation at the port." She declined to comment further. Imported Ford cars normally enter China via the eastern ports of Shanghai and Tianjin, she said. It wasn't immediately clear if General Motors cars imported to China from the United States were being impacted by the delays. GM plans to import only a total of about 150 vehicles to China from North America this year. "Virtually all products we sell in China are built in China," said a Shanghai-based GM spokesperson. China's top economic official, Liu He, will visit Washington next week to resume trade talks, the White House said Monday, after a U.S. delegation led by Treasury Secretary Steven Mnuchin came away from a visit to Beijing last week with no agreement over a long list of U.S. trade demands. China is the world's largest auto market but has been the focus of criticism from Trump over a 25 percent import tariff and foreign ownership caps on local auto ventures. China has pledged to remove the ownership limits and lower import levies. Ford has much to lose if the war of words over trade between China and Trump escalates into a full-blown tariff war. Last year, it shipped about 80,000 vehicles to China from North America, more than half of them Lincolns -- including the Lincoln Continental sedan and the Lincoln MKX crossover. All Lincoln vehicles that Ford now sells in China are brought in from North America. Last year the brand sold 54,124 vehicles in China, the world's largest auto market, up 66 percent from 2016. "China has started using these types of tools pressuring companies over political or trade disputes a lot more in the last couple of years," Coym said. She called the increased customs checks China's "intense quarantine method". She pointed to a political standoff last year between China and South Korea. South Korean companies that relied on Chinese consumers in sectors from retail to tourism were hit by increased inspections and a ban on tour group travel. "This is part of China's playbook now," said Coym. "We would definitely expect to see more of this as the trade dispute intensifies further," she added, referring to the U.S.-China standoff.